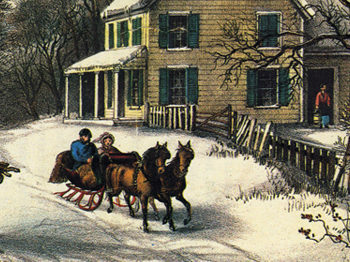 Christmas 1887 brought a flurry of activity to the Christian Scientists living in Boston. 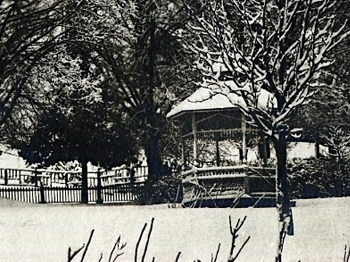 For nearly a decade, ever since “a little band of earnest seekers after Truth” — students of Mary Baker Eddy’s and therefore members of the Christian Scientist Association — had voted in favor of her motion to form the Church of Christ, Scientist,1 worship services for the group had been held in rented halls. Now, they were eager for a church building of their own. Socials, bazaars, and suppers were familiar fundraising avenues to those who had left mainstream churches of the day for Christian Science. At some point in the spring of 1887,5 the girls in Mary Eastaman’s Sunday School class had a bright idea. Why not hold a Christmas fair? 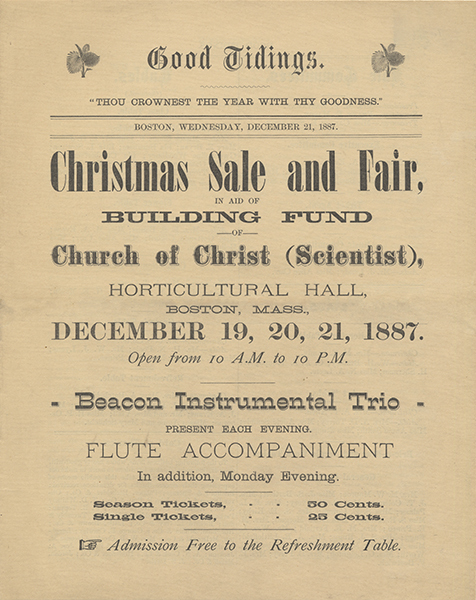 Program advertising the Christmas sale. Artifact, Longyear Museum collection. As for the offerings for sale, there was more food, including crackers, ears of popcorn, preserves, and candy. There was artwork, including paintings of all sorts, “on brass, porcelain, china, canvas, velvet, satin, silk.” There was bric-a-brac and needlework, from hand-painted and embroidered cushions to mantel-scarfs, tablecloths, and more.16 And there were books — some of them handmade. 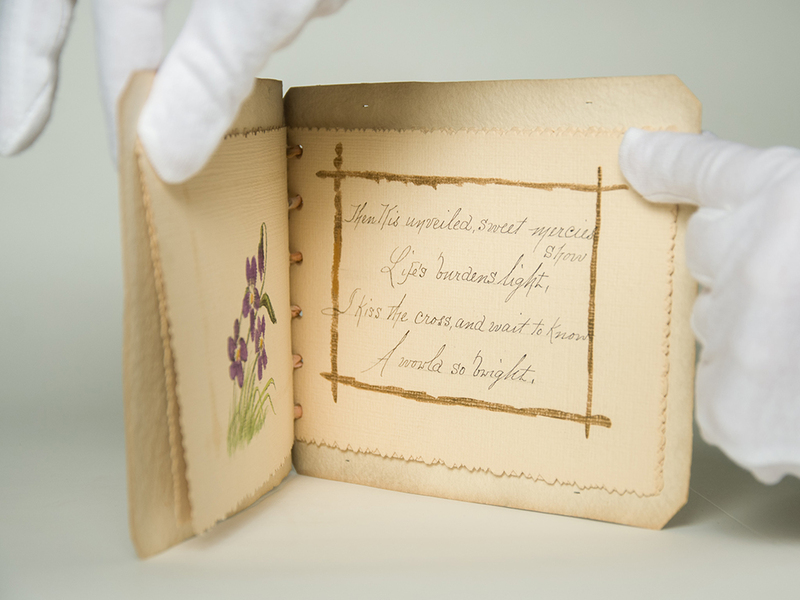 A handwritten and hand-painted book of Mrs. Eddy’s poem, “Christ My Refuge.” She would later edit this stanza to read: “Then His unveiled, sweet mercies show / Life’s burdens light. / I kiss the cross, and wake to know / A world more bright.” Held together by a ribbon, these delicate pages are examples of the way an individual crafted together art and the words of Mrs. Eddy. This was one of the items purchased at the Christmas Sale. Artifact, AF0328, Longyear Museum collection. 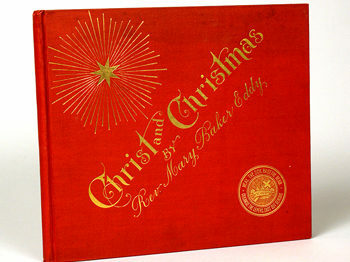 A handmade book of selections from Mrs. Eddy’s writings and from the Bible. The two quotations from Science and Health pictured here would also be edited by Mrs. Eddy: “Man is never God, but spiritual man, made in God’s likeness, reflects God” (p. 70). “Man is properly self-governed only when he is guided rightly and governed by his Maker, divine Truth and Love” (p. 106). 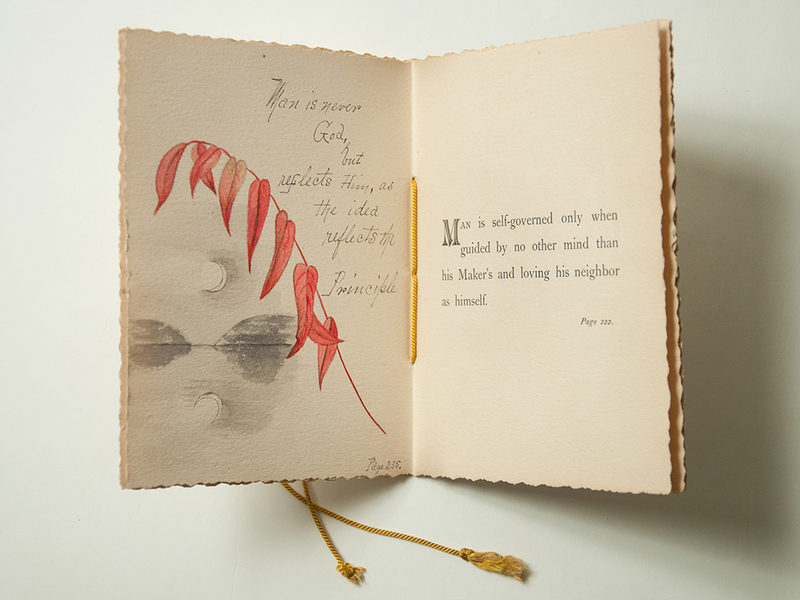 The pages in the book are printed, with the exception of one handwritten and hand-painted page, which is drawn with graphite, pen, and paint. This compilation was also purchased at the Christmas Sale. Artifact, AF0329, Longyear Museum collection. Despite her misgivings, Mrs. Eddy attended the fair on Tuesday evening with her son and his family, who were in Boston visiting from their home in the Dakota Territory. Their presence caused a delighted stir. 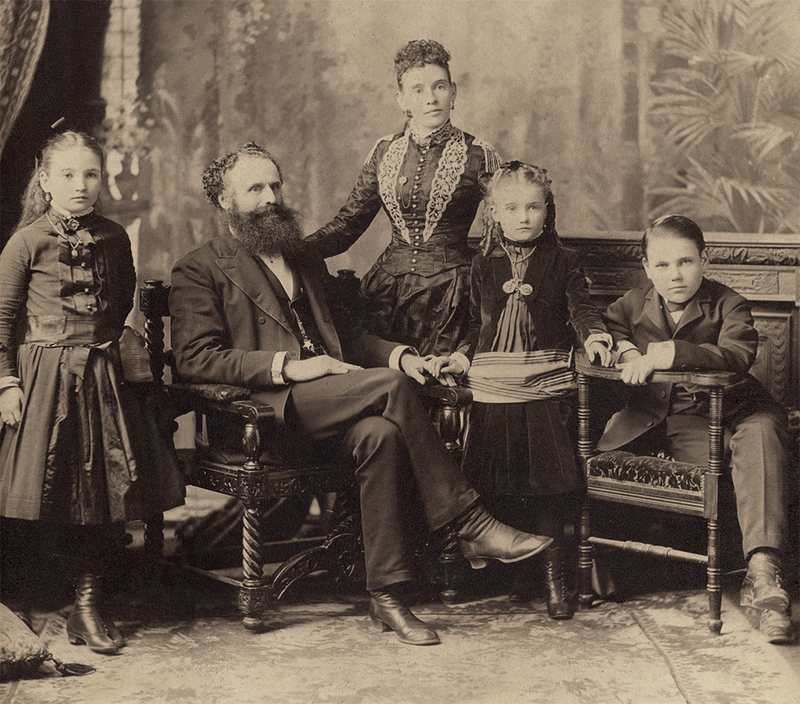 Mary Baker Eddy’s son George Washington Glover II and his family, circa 1887. From left to right: Mary, George, Nellie, Evelyn, and Gershom. Photograph, P0525-1, Longyear Museum collection. Within two and a half years after these words were written and the idea was “put back into the arms of Love,” the building Mary Baker Eddy called “our prayer in stone” was constructed, and Christian Scientists finally had a church to call their own. Mary Baker Eddy, Manual of The Mother Church, 17. Robert Peel, Mary Baker Eddy: The Years of Trial (New York: Holt, Rinehart and Winston, 1971), 240. Ibid. Peel pegs the mortgage at $8,763. The following year, the note was paid down by $3,000, leaving $5,800 at the time of the fair. Bliss Knapp, Ira Oscar Knapp and Flavia Stickney Knapp: A Biographical Sketch (Norwood, Massachusetts: The Plimpton Press, 1925), 57. October 20, 1887, Early Organizational Records 13 (1878-1889), The Mary Baker Eddy Library, Boston, Massachusetts (hereafter referenced as MBEL). “Church and Association,” The Christian Science Journal 5 (Oct 1887): 372. Mary Eastaman was the wife of Captain Joseph Eastaman. You can read more about her here. “Good Tidings,” Christmas Sale and Fair program, December 21, 1887, LMDB-8296, Longyear Museum collection, Longyear Museum, Chestnut Hill, Massachusetts. “Our Fair,” The Christian Science Journal 5 (Jan 1888): 529. See “Communion Service,” The Christian Science Journal 5 (Aug 1887): 264 and Stephen Gottschalk, Rolling Away the Stone: Mary Baker Eddy’s Challenge to Materialism (Indiana: Indiana University Press, 2006), 199-200. Bliss Knapp notes, “If the church members were not sufficiently advanced to learn through the inspiration of Science, then they must learn through experience. 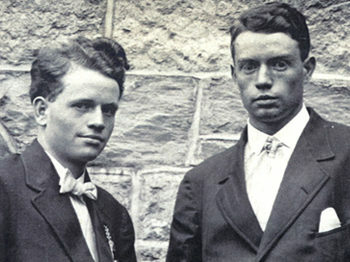 Mrs. Eddy was, therefore, quick to waive her opposition when she saw the course they must take, and she gave her consent for the church fair.” Ira Oscar Knapp and Flavia Stickney Knapp, 58. See also Peel, Trial, 240. S.H.C., “Our Church-Building,” The Christian Science Journal 5 (Nov 1887): 427; S.H.C., “Fair Matters,” The Christian Science Journal 5 (Dec 1887): 478. In 1901, Horticultural Hall acquired a new home at the corner of Massachusetts Avenue and Huntington Avenue, where it still is today. S.H.C., “Fair Memories,” The Christian Science Journal 5 (Jan 1888): 531. Bliss Knapp, The Destiny of The Mother Church (Boston: The Christian Science Publishing Society, 1991), 52. “Our Fair,” CSJ 5: 528. S.H.C., “Fair Memories,” CSJ 5: 531. “Our Fair,” CSJ 5: 530. 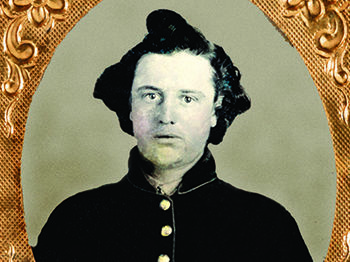 William H. Bradley had primary class instruction from Mrs. Eddy in 1883, and attended Normal class in February of 1886. 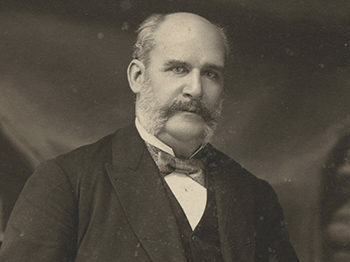 He had been named to two prior positions of trust in the Christian Science movement: the Finance Committee of the National Christian Scientist Association, tasked with auditing the books of the Treasurer, in April 1886; and in October of that year, he was appointed Secretary of the Christian Science Publishing Society. Perhaps not surprisingly, in light of what transpired, at the December 3, 1888 annual business meeting of the Church of Christ (Scientist), “it was voted that our Treasurer be required to furnish bonds.” EOR 13, 1878-1889, MBEL. Gottschalk, Rolling Away, 200; Knapp, Destiny, 60-95. For further information on this complex series of legal transactions, and the history behind it, see Margaret M. Pinkham, A Miracle in Stone (Santa Barbara, California: Nebbadoon Press, 2009), and Gottschalk, Rolling Away, 199-210. The Deed of Trust by which Mrs. Eddy conveyed the land to the Christian Science Board of Directors can be found in the Church Manual, 128-135. Mary Baker Eddy, Miscellaneous Writings 1883-1896, 140-141 (originally published in the July 1892 issue of The Christian Science Journal, titled “Hints for History”).